When we crossed the Pacific, the longest sail we did was from Galapagos to the Marquesas in French Polynesia. It took us 20 days and 18 hours from when we lifted anchor in San Cristobal to when it was firmly set again 2984 nautical miles later in Angels Bay on Fatu Hiva. It was excellent. I enjoyed it from beginning till end and when it was over I was actually disappointed. We agreed that it could easily have lasted longer and it wouldn’t have mattered. The reason it was so good was that everything worked so well, from the boat to the people onboard. I made a shift routine so that we at all times had two people on watch. Everyone worked one day shift of 6 hours and a night-shift of 4 hours, then every 5 days you would do two night-shifts, but then have the next day (18 hours) off. The food made mostly by Elisabeth and Jacob was varied, delicious and a definite highlight of the day. Like on the Atlantic crossing, we had it around 1 or 2 in the day, when everyone was awake. In the freezer we had a good variety of vacuum packed meats that was artfully combined with fresh produce or canned vegetables to make memorable meals. In addition we fished along the way and caught several Mahi Mahi that we thoroughly enjoyed. The picture above is from our 17th of May breakfast … I think our faces tell the story. When speaking about food, I have to mention our breakfasts. We needed to figure out a breakfast that was cheap, nourishing and easy to store onboard. We landed on oats and I had oatmeal for breakfast pretty much every day of the crossing and loved it. Now I am a mediocre chef at best and even cooking oatmeal can be a challenge. Thankfully I’m very easy to please and I am not a tough food critic. The night-shifts were pretty excellent as well. I have 120 gigs worth of audiobooks and lectures, so we all sat and listened to our iPods going through audiobooks and lectures like there was no tomorrow. I listened to a TTC lecture by Robert Greenberg called “How to listen to and enjoy great music”. Imagine listening to and being explained fantastic classical music while you are looking at this. I have seen so many shooting stars that I’m running out of wishes to make. I’ve actually had to start re-wishing, because I didn’t know what more to wish for. The biggest event on the trip was unquestionably our 17th of May celebration. To the historically, culturally and geographically challenged reader this date is Norway’s constitution day and it is a BIG celebration in Norway. To us it was obvious that it needed to be done in style. Martin spearheaded the 17th of May committee and quite a day was planned for us. The day started with us catching and releasing a barracuda that was way too small, before we caught a very nice Mahi Mahi (that we ate the next day). We all dressed up in our finest and at 09:00 I shot the morning salute with a flare. I know it’s illegal to fire a flarewhen you’re not in distress, but I shot it low and well, it was 17th of May and we needed to start the day properly. After the salute we enjoyed a sensational breakfast with freshly baked bread. After breakfast it was time for the children’s parade. This consisted of Martin, Elisabeth, Jacob and I marching in a big circle around the boat, singing all the good songs: “Det er Norge i rødt, hvitt og blått”, “Alle fugler”, Mellom bakkar og berg”, “Vi ere en Nation, vi med” and of course “Ja, vi elsker”. To anyone not Norwegian (Read: Topi, the 5th member of the crew), I’m sure we seemed like a group of ultra-nationalists, but to us it was priceless. After the parade the Captain held a speech, re-dressed in his absolute finest. Then it was time for games. The game or competition was simple, carry a beaker of water from the aft end on a complete circumnavigation of the boat, without spilling a drop. Everyone got to try twice, where the best lap time and least amount of spillage determined who won the tournament. The standings were: 5. Martin, 4. Andreas, 3. Jacob, 2. Elisabeth, with Topi claiming the cherished price: A cold snickers. Martin might have come in last, but he sure knows how to lose like a champion. We now moved into the peoples parade … or what we call Folketoget in Norwegian. This is where clubs, organizations and associations parade through town and sing songs. The picture shows who we represented: Topi>Finland, Jacob>NAL, Elisbeth>Female Spearfishers, Martin>Madla Swim team, Me>Ship Owners Association. We now had time to relax and enjoy a great hot dog dinner while darkness fell. Then we headed inside (while Topi gracefully kept watch) and watched Max Manus and ate a sensational chocolate cake Elisabeth had baked. Don’t we look like schoolchildren, all lined up with our cakes and drinks neatly in front of us? Yes, diving off a boat while you are sailing is a bad idea at the best of times … We saw 3 sharks on our crossing … One of them was a 5 meter long Bull Shark. 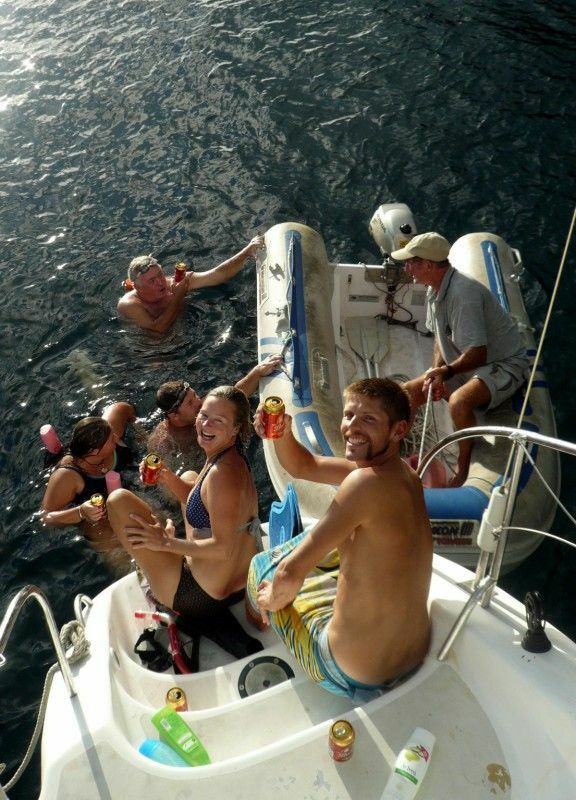 Still, it was too tempting not to tempt fate a little and we all had a great time diving off the boat. With fun-filled activities like this taking up our days at the end of the journey it is no surprise that it almost startled us when we suddenly sighted Fatu Hiva on the horizon. 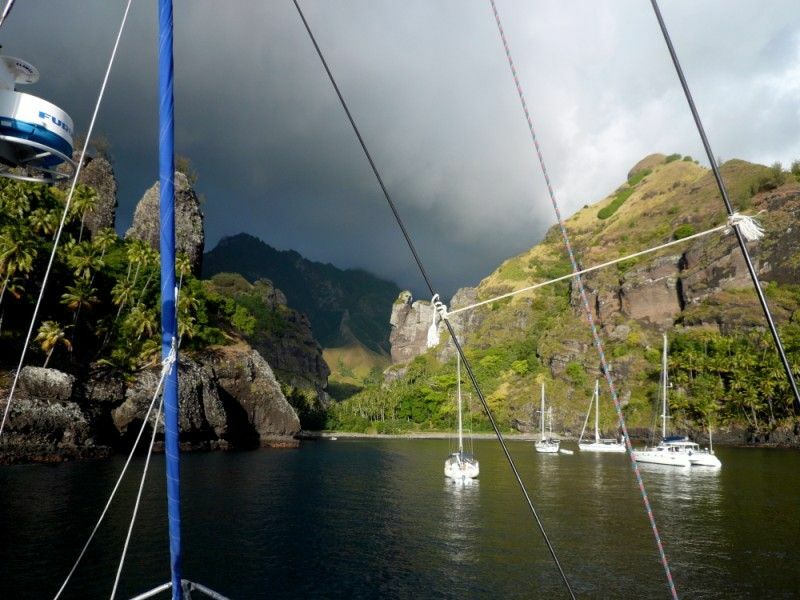 When we pulled into the Bay of Virgins on Fatu Hiva we knew we had arrived in paradise. 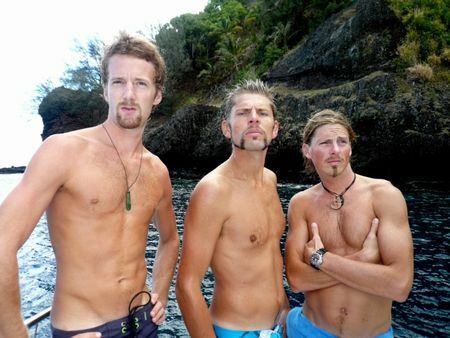 It also gave us a chance to resolve our final competition: Who could look the most tacky with the facial hair we had not cut during the entire crossing. You be the judge. The only other hitch … We had to go out and party and be with other people wearing our tacky mustaches. We had hardly dropped anchor before the guys and gals from the boats: Liquid Courage, Troutbridge, Legend 2, Haze and Vagabond came swimming by to greet us. Our facial hair received a number of jokes, but when we cracked open the beers … well, thank God that alcohol dulls ones senses. We hadn’t had a drop of alcohol in 3 weeks, so we would have been cheap dates that night, but a great night it was! The crossing had been great and it could honestly have lasted quite a bit longer before I would have been eager to get to land. For now I will have to settle for the paradise islands of the South Pacific … yeah, I know: Life is tough. My friend the crazy bearyou showed on this article looks amazing… please leave it like that more often!